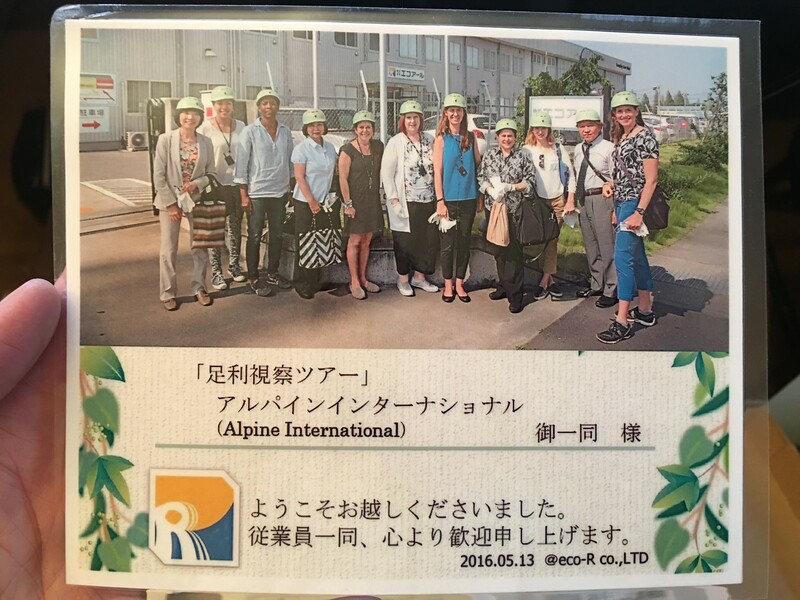 At the end of the tour, each of us received this laminated photo as a gift and certificate of our visit. 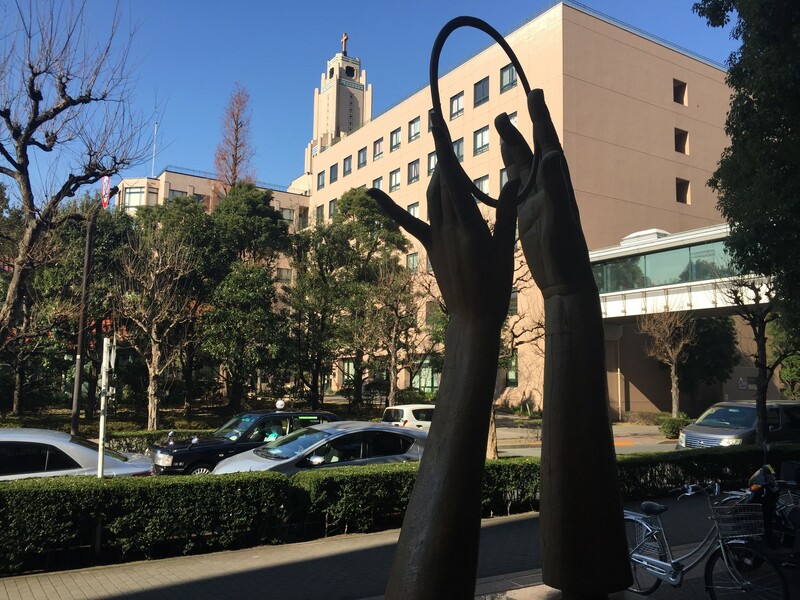 As I’ve written about in earlier posts, last spring I led a study trip to the Japanese “5S City” of Ashikaga to learn about how organizations in the town practice Lean management and how the concepts of “joy” and “revitalization” are a special elements to “Ashikaga-style 5S”. 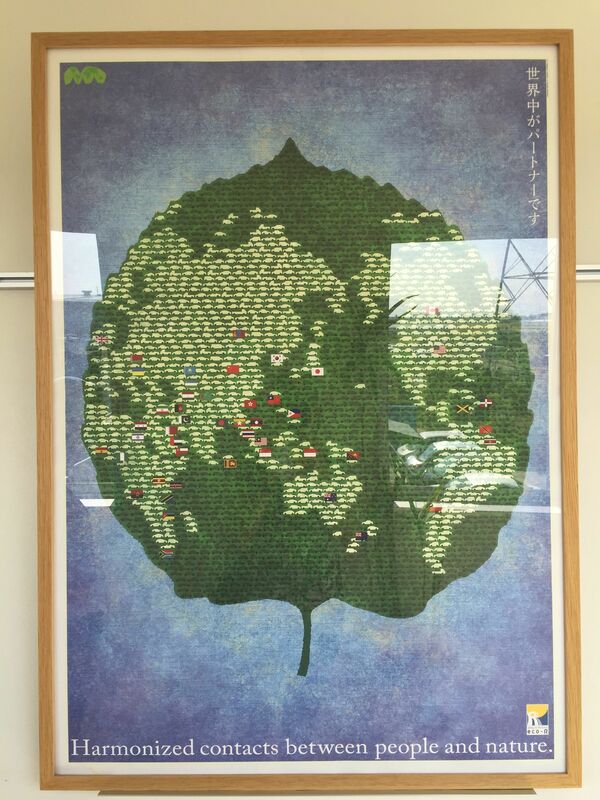 One of the beautiful posters in the Eco-R offices that illustrates their commitment to the environment and world. 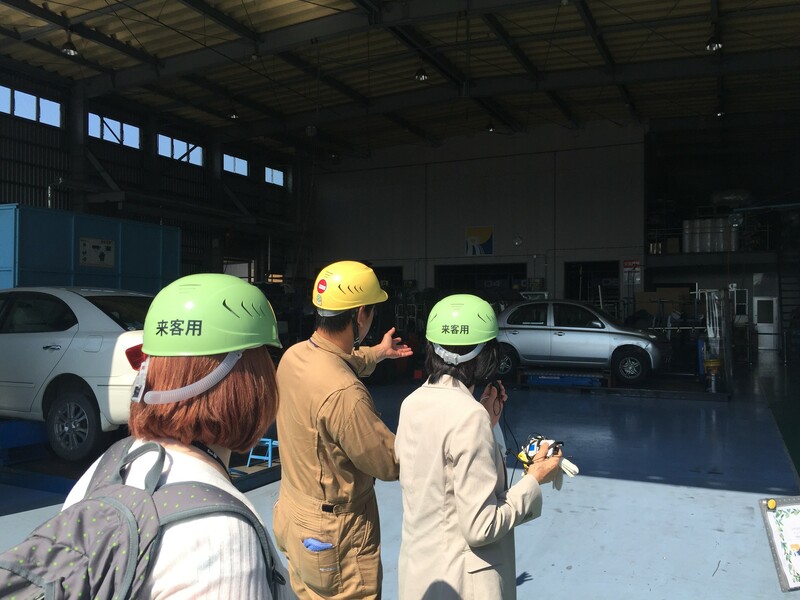 The second factory that we visited during our visit to Ashikaga was Eco-R, an automobile dismantling, repair and recycling company. What impressed me the most about Eco-R was its commitment to their community and to having a broader positive impact on the world. It was amazing to see how they are able breakdown and either repurpose or recycle almost every part of old vehicles! Their motto is “Love Mother Earth” and it comes through in their mission and their day-to-day efforts to do their work and continuously improve. 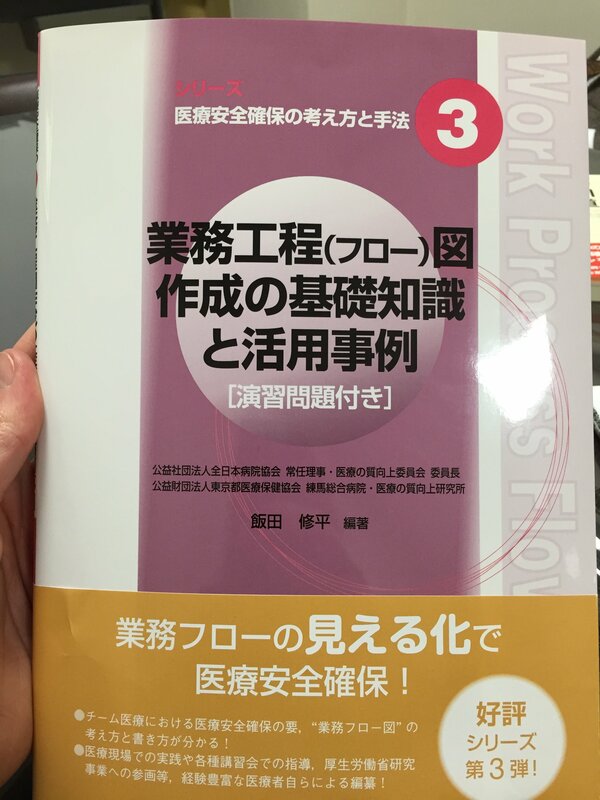 Like over 150 companies and organizations in the town of Ashikaga, they use the 5S principles as the method for maintaining an organized work environment. 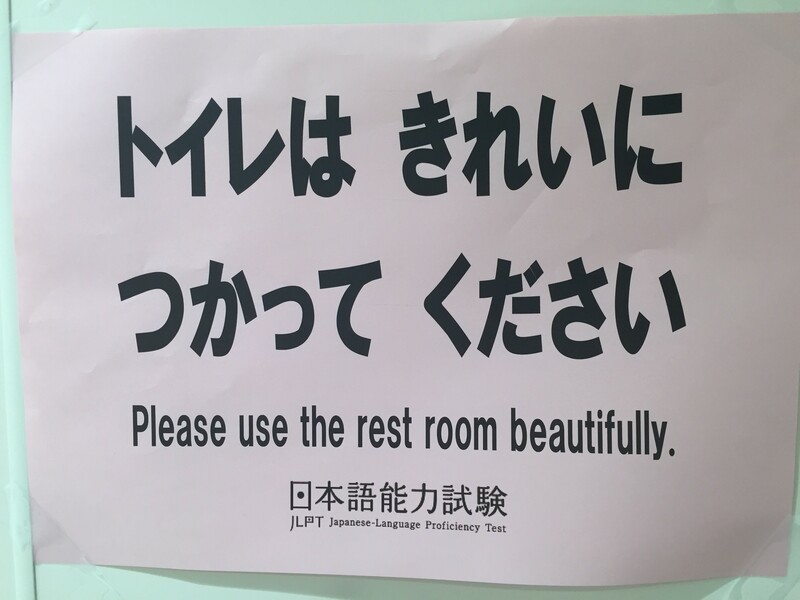 Eco-R, like many companies I visited in Japan, has a strong focus on doing good for their broader community not just through their products but by engaging in the community. For example, every two weeks employees volunteer to clean-up areas in Ashikaga to keep the town clean. Eco-R aims to recycle almost every part of each car. The current President and son of the founder, Hiromichi Ishii, spent time with us explaining the history of Eco-R and their management practices. The organization’s goals are to “pursue the happiness of our employees” and “realize a bright and joyful society”. They see 5S and kaizen as they way the develop their people and achieve the organization’s goals. Mr. Ishii said that it is important for a company to have a strong vision so that “we can focus all of our strength into a single direction”. The company was established in 1964, the same year of the Tokyo Olympics and the launch of the first Shinkansen (bullet train) in Japan. Mr. Ishii explained that his father’s inspiration for founding the company was that “if there is someone making cars, then someone is needed to repair them”. 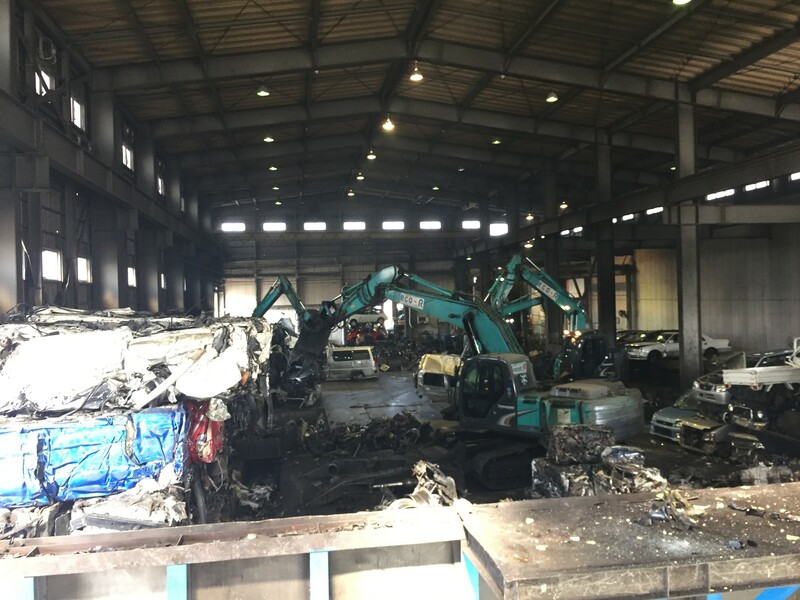 Mr. Iishi said that the former process of dismantling cars was like a “barbecue”. The community complained of the black smoke and fumes and did not think highly of the company, which in turn made it hard to attract and retain talented employees. View of the Eco-R recycling facility as we drove in. 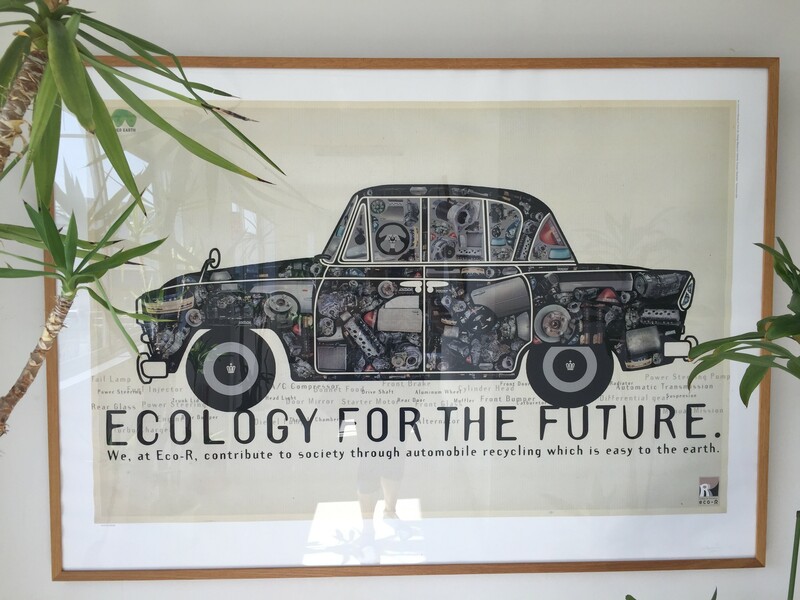 In 2006, the company changed its name from Ishii Car Industy to Eco-R and shifted its focus from repair to recycling. This change came about in response to two factors. 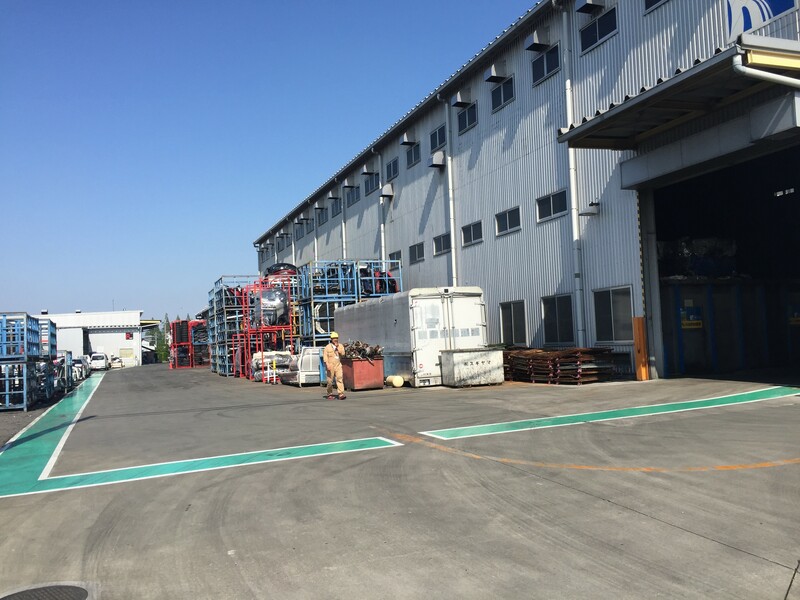 The company wanted reconcile with the community of Ashikaga and develop a cleaner and more environmentally friendly process for dismantling cars. They decided that they had to change and figure out how to create a more environmental process for car disassembly and recycling, which would be better for society as a whole, for the company and for employees. 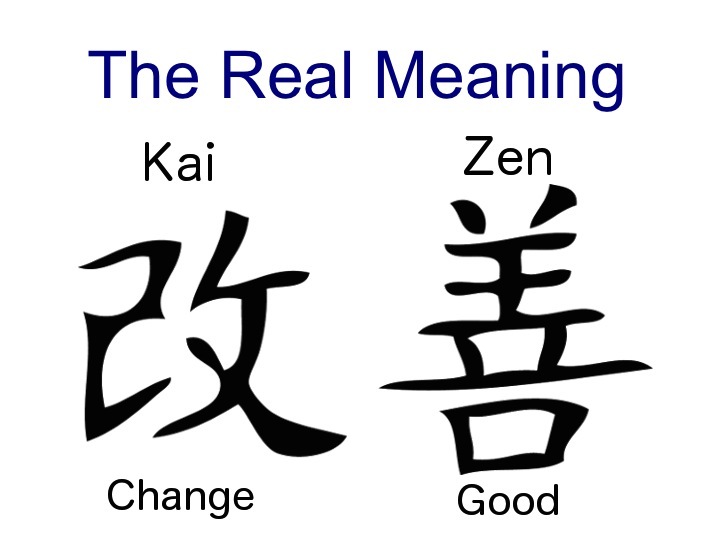 5S and kaizen have been an important part of the sucess of this shift in the past decade. 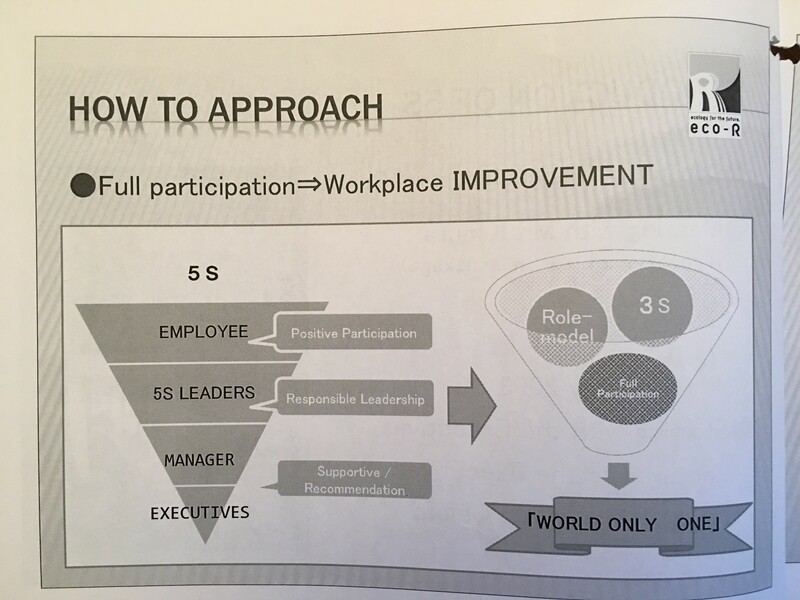 Mr. Ishii walked through a presentation about the role of 5S at Eco-R. 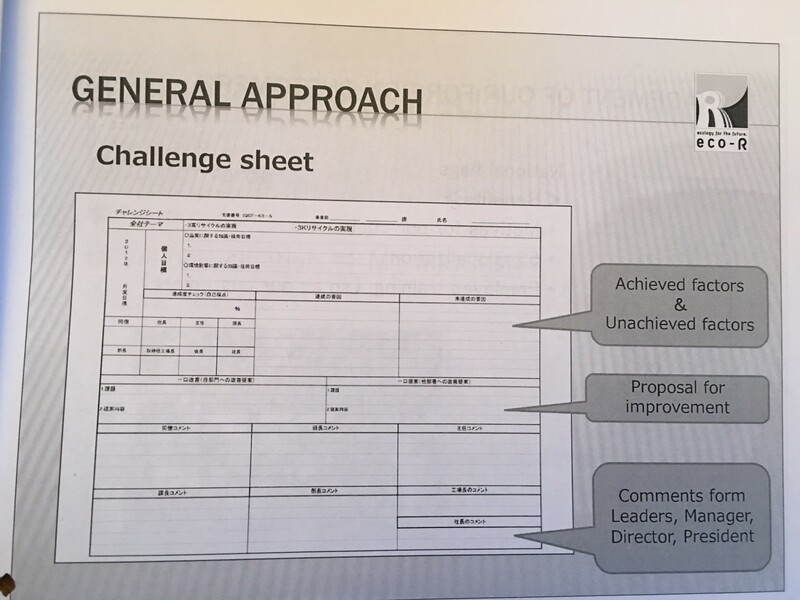 I have included images from some of the handouts that he provided. 5S levels of responsibility from front line to senior leadership. 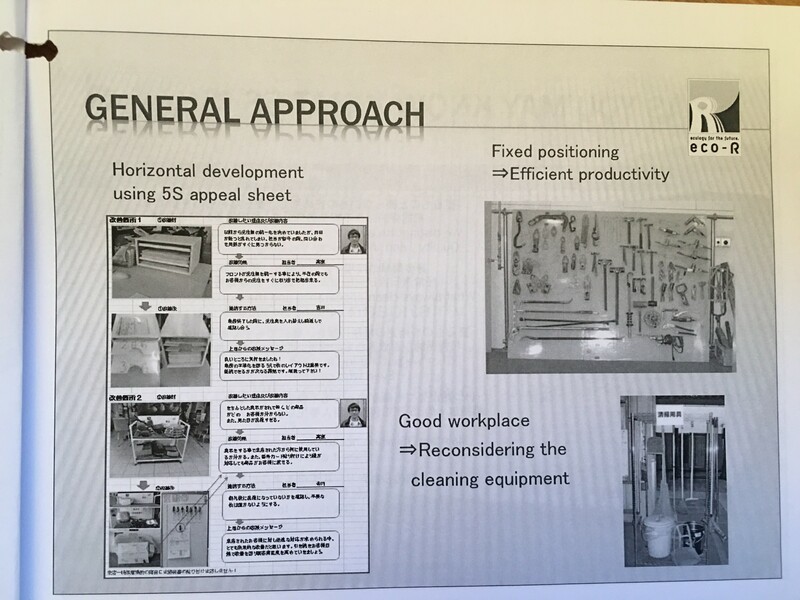 Mr. Ishii explained that 5S is a means of improvement towards their broader organizational goals and to ensure a safe working environment. Eco-R has a 5S committee that consists of 10 people who take leadership in different areas across the company to lead ongoing improvement efforts related to 5S. This 5S committee is also a way to develop staff into leadership roles. Twice a month, each group does an early morning deep clean of the factory to ensure that the disassembly plant remains tidy. 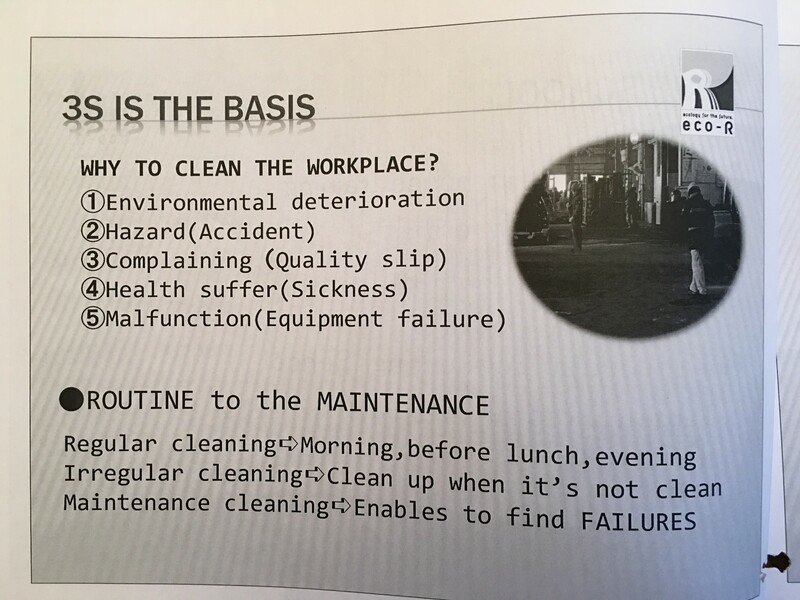 During our tour of the site, our guides also explained that kaizen is a daily practice and that all staff are encouraged to look for improvement in their work. At their daily morning huddle, managers will announce new changes that were made due to employee ideas. Our guides explained that during the disassembly process, workers do not put anything on the ground unless they have to to help contribute to a 5S environment (so that tools don’t go missing, etc). If they currently “have to” put something down, managers encourage the staff to put forward kaizen ideas to eliminate this current need. Having the goal to not put anything on the ground encourages employees to always think about how they can improve their process. 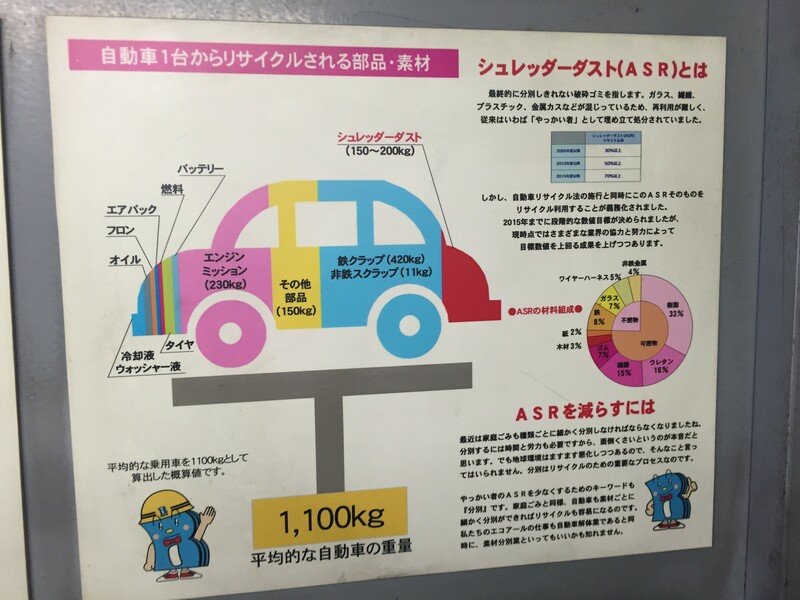 During our orientation session, we learned about the 14 major steps of the process flow for car disassembly and recycling at Eco-R include the following. You can see a another presentation by Mr. Ishii that explains the history and processes at Eco-R here. 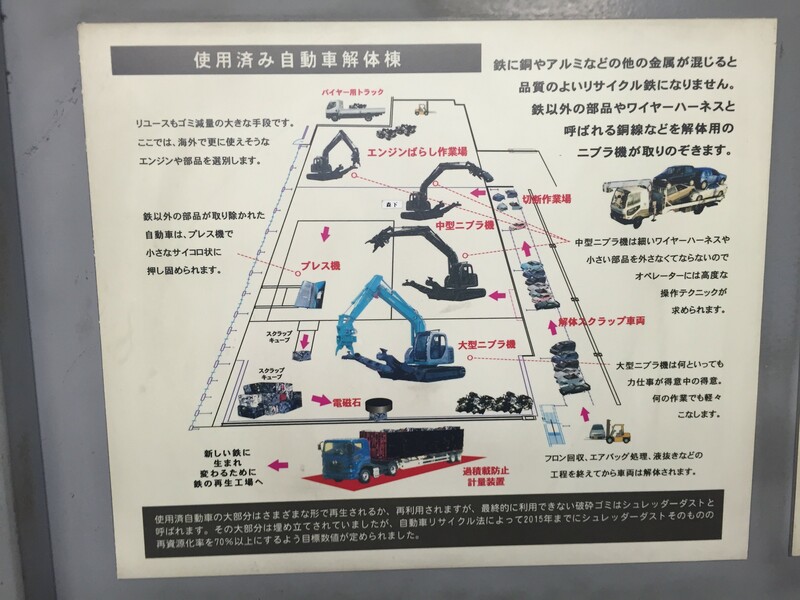 On our tour of the Eco-R plant we got to see steps 3-8,and 13 described above. First we got to see how they deploy airbags before disassembling them for recycling. Employees have standard work to ensure safe deployment of the airbags before they are removed from the vehicles for recycling. When tires are removed, they are all individually inspected “with hands and eyes” to determine which tires are suitable to be resold and reused, and which will be recycled. We then got to watch the automobile scrap process. For a scrap metal factory, it was impressive how seemingly tidy and organized the warehouse was. In front of us, cars that have already been stripped of their non-metal components are picked apart by vulture-like machines with giant pinchers (that are operated by humans) called “Nibblers”. These Nibblers are highly precise and can rip out and remove components within the car. Then metal shells and ripped of parts of the cleaned-out cars are lifted by a giant magnet attached to a crane and put into a crushing machine. The crusher compresses the car into a dense box of metal and is again lifted by the magnet and stacked along with the crushed carcasses of former cars for transport to an offside metal processing center. Our whole group was fascinated by this scene of prehistoric metal creature devouring their less fortunate machines and took many videos to show our kids! We then moved to another building that houses the resale office and car repair center. Repurposed and new tires for sale. Onsite they have a resale store that provide tires, wheels, audio devices, GPS and other repurposed parts at reasonable rates. 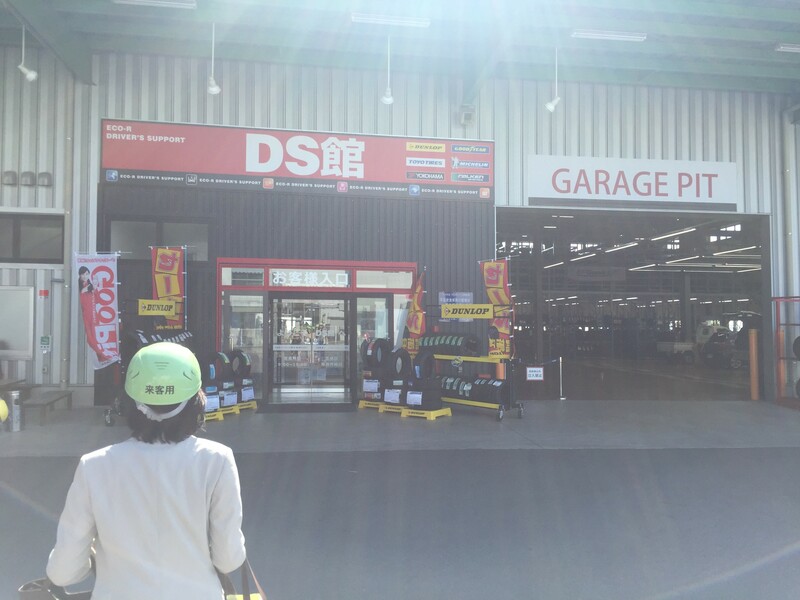 The main shop was bright and airy and looked like any automobile parts store. On the lower level, a shop sells recycled and new components for cars. 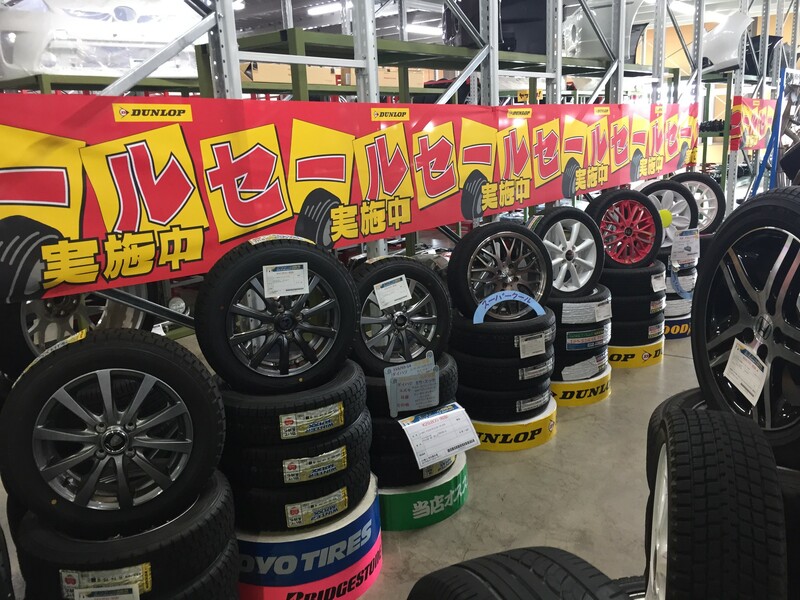 On the upper levels, were rows and rows of used and new tires for sale. Each tire has a unique identifying number and bar code so that customers can know the exact history of its previous use and how much “life” is left in the tire. While I learned less about the management system and processes about 5S on this visit than I did at Ogura Metal earlier in the day, I was impressed by the organization’s passion and commitment to the environment, to their community and to their people. 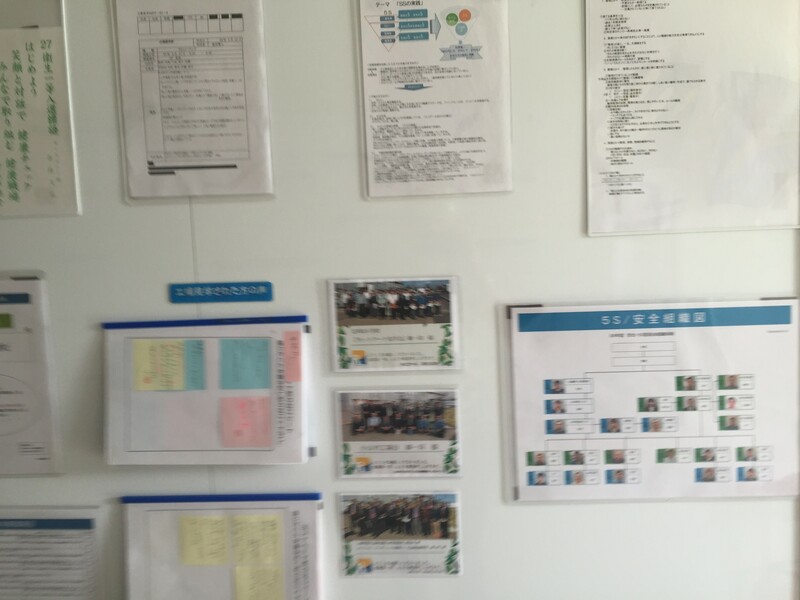 The Ashikaga approach of using 5S to revitalize the organization and bring joy to people by engaging them in kaizen was evident in all of our interactions with staff and during our tour. 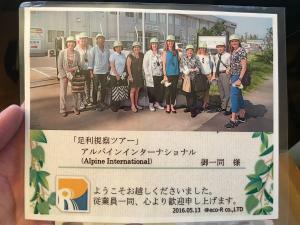 Mr. Ishii has clearly turned the company around in a 10 year period from one that was looked down upon for pollution to one that is respected in the community and is serving a greater purpose to Love Mother Earth. “Upcoming Japan Lean 5S Study Trip: “Best of Ashikaga – Lean Management, Rural Winery, Japan’s First School and More! The first three posts in this series were also just cited in Tom Ehrenfeld’s Lean Roundup article on 5S for the Lean Post. Check it out for other great resources and information about 5S. If you enjoyed this article and are not already a subscriber, sign up below to become one of the first to know about new posts. If you are already subscribed – thank you for following my blog and being part of this community of lean thinkers! 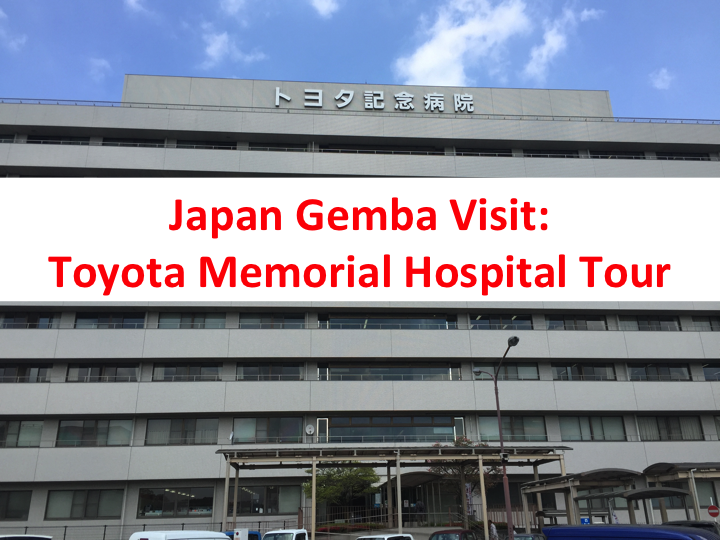 In upcoming blog posts I’ll continue to share what I’ve learned from site visits to other Japanese organizations, and ongoing reflections on Lean and leadership. Plus, I’m planning another trip to Japan in May and am lining up some great site visits and experiences that I will be share with you here!